Helping people transition from lives of SUCCESS to lives of SIGNIFICANCE! As a boutique financial services practice, we provide customized advice to individuals who have achieved a degree of financial success but desire to share some of the burden of managing the details of their financial life so they can enjoy their true passions. We facilitate the freedom to move on to achieving significance in the next phase of life, whatever your view of significance consists of! We specialize in portfolio management, alternative investments, and retirement income planning, with a focus on goal attainment, not beating an index. Our clients range from NFL All-Stars to the "millionaire-next-door" types who seek access to the most advanced investment options available. We have relationships with CPAs and Estate Planning Attorneys to ensure that as a team we can address the most complex challenges our clients face. Your financial plan should change and grow alongside you and your family. We know from experience that while keeping an eye toward the future is important at every stage of life, clients in their 40's usually have different needs than clients in their 60's. By saving and investing well in your younger days, you accumulate wealth that will eventually provide income to live on once you retire. What is your wealth doing right now? Choose an option below to learn how we can help meet your financial goals. 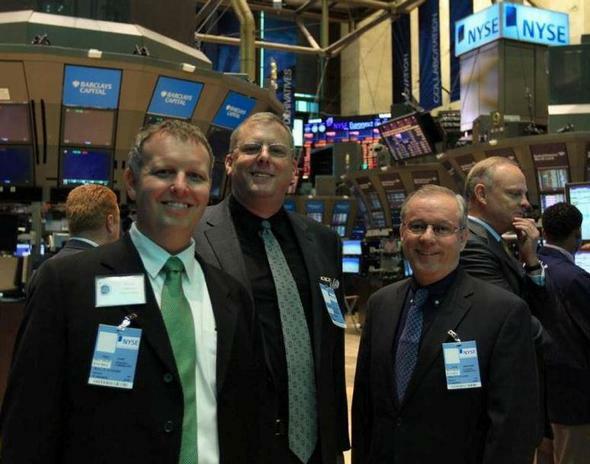 David Hollands, Trey Cure, and John Emerson on the floor of the NY Stock Exchange!